C'est le but ... de faire un meilleur champagne. If someone asked me to imagine a French champagne maker, I would envision him to be just like Emmanuel Pithois - gregarious and jovial until he starts to explain the very serious process of making champagne. For not only does this craft provide Emmanuel with his livelihood, it's the profession that he shares with his father, his grandfather and hopes to pass on to his son one day. For three generations, the Pithois family has worked the land, tended the vines and pressed the grapes. All with one goal in mind, to make a better champagne. If you would like to learn how grapes are transformed into champagne, visit Emmanuel in Verzenay or scroll down the page for a photo tour of his champagne making facilities and cellar. 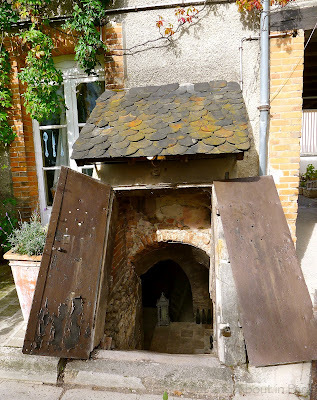 Maison des Vignes de Verzenay (Click here to read my post about Catherine and Emmanuel's B&B). After all of the grapes have been picked by hand according to the laws regulating the production of champagne, they're pressed to yield a specific amount of juice. The three main types of grapes used to make this bubbly beverage are Chardonnay, Pinot Noir and Pinot Meunier. With the approval of the chief government administrator of their department, each village decides the date that the grapes will be harvested. The harvest in Verzenay is expected to start on September 13, 2012. The juice is fermented in stainless steel vats until approximately February of the following year. Next, a second fermentation is induced by adding sugar and yeast just before it is bottled. No matter if you visit Pommery, Moët et Chandon, Taittinger, Veuve Clicquot or Pithois, they're all going to emphasize the importance of the yeast sediment that develops in champagne. For as the champagne is aged, it's the yeast cells that impart complex flavors to it. The best and most expensive champagnes are aged for five or more years. Once the champagne is finished aging, the sediment must be removed. 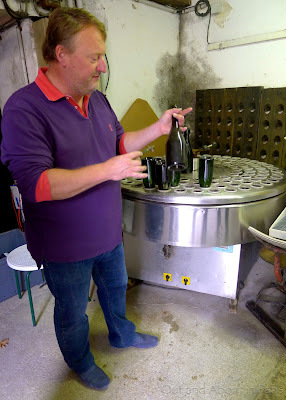 To collect the sediment, the bottles are positioned with their necks down for a period of up to six weeks. During this time, they're riddled (rotated) to help dislodge the sediment from the sides of the bottle. Riddling may be done by hand or while the bottles are in crates like the ones shown above. An experienced riddler can rotate 35,000-40,000 bottles of champagne per day. As the sludge used to be the only downside of drinking champagne, someone had the clever idea to flash freeze the neck of the bottle and remove the temporary cap in order to disgorge the accumulated sediment. A dose of liquor (sugar and wine) is added to top off the bottle. At this point, the bottle is closed with a cork and sealed with wire. The champagne is mature and ready for sale. To preserve its taste, keep champagne in a dark and preferably cool place. According to all of the guides of the champagne houses that we visited, there's no point in aging champagne because it won't get better like some wines do. In fact, champagne can go off if you store it for too long. Trust me, it's true! Stéphane and I found out the hard way after we kept a bottle of Dom Pérignon to drink on our daughter's twentieth birthday. When we finally popped the cork, it tasted so awful that we ended up pouring it down the drain. If Emmanual Pithois invites you into his cellar, be sure to accept his invitation. I'm sure that you'll be pleased when you sample the fruits of his labor! Yes, as for aging. 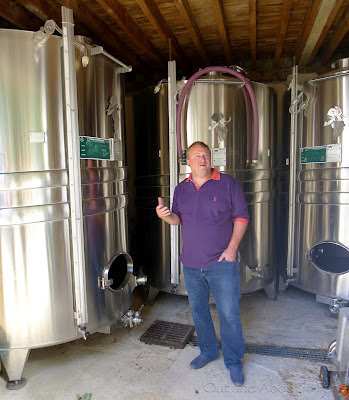 Let the winemaker age the wine, in large casks. Generally they release the wine to market when it's ready to be drunk, give or take a couple of years depending on house. And it may be a vintage year, 10 or 15 years old, or it may have no real age at all. A vintage bottle in your local wine shop has likely not been sitting there since 1988. Also, many smaller producers now share the disgorgement date on the bottle which tells you when the sediment is removed from the wine/champagne. Did you feel obliged to take a case home from each vineyard? Thank you, Joseph! Disgorgement was exactly the word that I was looking for but couldn't remember. After reading your comment, I went back and edited my post to use it. Obliged? No. Tempted? Yes. We decided to get a case with an assortment of champagne from Emmanuel Pithois because we can't buy it in Paris. After doing some price checking at the big champagne houses, we realized that it's the same price in Reims as it is in Paris so we only got a couple of bottles at Pommery. Thank you, Mary, I feel like I was there on the visit with you! Fascinating. We had a similar stored wine incident. We bought a bottle of 1994 Pouilly Fumé to keep and drink on Caiti's 18th birthday. And when the day came it was awful! Live and learn. Live and learn is right. As one of our tour guides said, "Every day is a good day to drink champagne so there's no need to store it!" It was a pleasure to visit Caiti's blog and I look forward to reading about her experiences at uni in Bordeaux! For the love of all things fabulous! Tubs and tubs filled with champagne!!! Holy merde! My mouth is watering right now. You must have been in heaven, I know I would be! You are so amping me up for my trip! As usual, thanks MK! xo. Ella, you are going to have a WONDERFUL time in Reims. Please tell Seb that I think it was a brilliant idea to take you there for your birthday! You'll see more bottles of champagne than you thought possible. And tasting it is pretty good too! Your ears certainly perk up at the word champagne, Mike! I'll remember that the next time that I want to get your attention about something. I'll say "Champagne. Has anyone else noticed that this Three Brooms Sauvignon Blanc tastes remarkably like peppers? Champagne." That should do it. I'm still laughing about how I was completely ignored by you three Bostonians. I mean, was I wearing a cloak of invisibility or what?!? Blogging and commenting!!! - As Blobby said, "Pace yourself son - pace yourself." As usual, a wonderfully informing post Mary Kay. Just wondering though, whether the person who does the "riddling" is known as "the riddler"? "Riddler" is the term that all of our guides used. Since I had the same question as you during our first tour, we even asked the guide to confirm that "riddler" is the English word for "remeuer". Can you imagine spending your time in a dark, damp cellar rotating 35-40,000 bottles per day? To keep the profession alive, the major houses still employ riddlers to turn bottles of champagne by hand. It was also interesting that each house had a different system for riddling. I don't remember the specifics but it was something like 1/4 of a complete turn clockwise followed by 1/6 of a turn counterclockwise.